A Cheery Blue Bird that won't fly away! 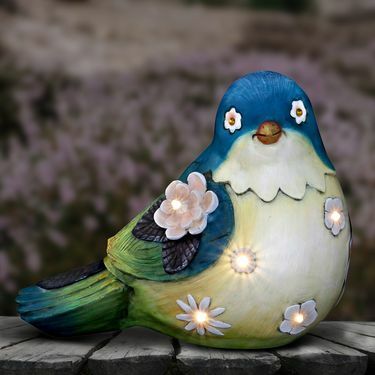 This beautifully hand painted solar blue bird statue will stay in your garden and illuminate automatically at dusk so you can enjoy his presence day or night. Made of durable resin for all seasons and UV treated to resist fading, an adorable addition to any garden! Size: 11" x 6.25" x 10.75" H.